Through creations of new generation born in 1980s with features and influence of post-modern society, we could see values of young generations in present China, including anti-modernism and pluralism directly transplanted from the western world. In a reminiscent mood, the post-modernists claim that they fully understand the position of technology in present society and are trying not to be too naive to believe technology is the master solution of all social problems. The artists tend to explore in daily conversation fashionable, grotesque, obscure and unreasonable forms and the art critists are writing in the theses suppositional, collage, mock and cross-regional hot words, both of which are reflecting the real life and strengthening the cultural logic of post-capitalism. Although critisizing the post-modern plane collage being in lack of emotions, depth and meanings as well as conception of history and cognitive map, the modern artists of consumptionism in a reminiscent mood could still present the hustling and bustling visual art with a piece of pure land visually and aesthetically, of great ease and comfort. The scenes that ancient literatis indulge in hills and waters with child servant serving tea beside and halt in pavilions occasionally have been presented by Flower Wu with today’s suppositional cartoon plots, trivial objects in daily life or clamouring wars and conflicts. 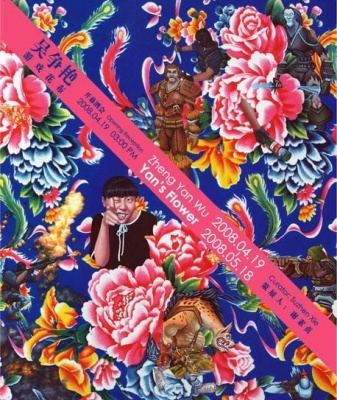 The creastions of Flower Wu are not provocation of new generation full of complains and earth-shaking surprises, but deriving memorial elements from life, slowly raising heads and posing and hiding in pistils, thus coming into a metaphor of modern literati paintings of China.